Hi I want to monitor our Meraki network using PRTG. I have downloaded the mib file from Meraki and imported it to PRTG. Using this in a SNMP library sensor I get sensors set up for access points, SSIDs and lots of sensors that are related to the access points and SSIDs like their status, is a the access point a gateway etc. Unfortunately I can't tell which of theses sensors for status, gateway etc are related to which access point. Is there a way I can create sensors with multiple channels to group these related sensors together, and that would discover the access points in the network rather like the Cisco snap VPN sensor? There are two very distinct ways of querying Meraki devices, they can either be monitored via the cloud(dashboard) or directly (using the individual AP IP addresses). The information available using each method is distinct. Meraki has an excellent SNMP Overview and Configuration article available at their website. By default, Meraki devices cannot be polled from outside the network. However, after setting up the community string, an MX can be configured to allow polling from a remote IP whitelist, configured under Security appliance > Configure > Firewall & traffic shaping. The built-in SNMP Traffic Sensor should also work but doesn't as Meraki's SNMP agent implementation does not respond to uptime queries. While PRTG doesn't offer any alternative built-in sensor for Meraki's devices our Custom Sensors or this device template allows you to monitor your AP's Status and traffic counters. Continue reading for instructions. When monitoring the controller (with the correct SNMP Credentials) it's possible to discover and monitor the status of each connected AP. When using SNMP v2c and querying any Meraki device (AP, Switch, Firewall, etc) this will produce custom traffic sensors via the counters from the ifXTable. Head to PRTG's Web-interface, navigate to Setup > Administrative Tools and perform a "Load Lookups" operation. Create a new device in PRTG with the Address(IP or FQDN) of the equipment that you want to monitor, configure the SNMP Credentials accordingly. Right click on the device, select "Run Auto Discovery With Template", select the 'Custom Meraki' from the list. Channel limits or lookups may need to be adjusted to your needs. 0.2 2017/01 Switched from meta=snmp to meta="snmpnext" with a custom OID for increased compatibility. Can I also manually add these sensors? thank you very much for your KB-Post. I'm afraid it might be best to consult with the vendor of the devices, to see which counters may refer to which AP. Or if there may be a way to use the counters per AP. Native support for Meraki devices is currently not planned, sorry. Please consider adding Meraki support. Hi, I have tried using the SNMP traffic sensor to monitor an AP directly. The interfaces of the AP are listed as I setup the sensor, I select them and continue, but then the monitoring shows the error 'no such name'. As the interfaces were detected during the setup of the sensor I am guessing that the AP was queried to get the interfaces so the connection to it over SNMP is OK. Any ideas why I would then get the 'no such name ' error showing immediately? Can you please upload us a screenshot showing the "Settings"-Tab of such a SNMP Traffic Sensor here with this error? Thank you. Hi Torsten, will do. I have probably missed the obvious instructions but how do I upload a screenshot? I'm afraid image uploading is not directly possible in our KB. Please use any image - sharing service, upload the screenshots, and then link them here. Thank you. I have just been thru this process, and the issue is that Meraki do not support the sysUpTime OID (1.3.6.1.2.1.1.3.0), which causes the sensors to fail. My last response, as of April 2014, is that they do not support this and have no plans to add it to their implementation of SNMP on the devices. Which given its a mandatory part of the SNMP specification, is really rather poor......and i'm actually going to return over 100k of hardware because of this, if they don't fix it. I have the same issue 'no such name ' error with SNMP sensors. Did anyone solve this issue or found a workaround? There are two ways to monitor Meraki devices (see Meraki's article). You set this up in the Organization->Settings->SNMP and it gives you a specific server (n34.meraki.com or similar and NOT the device IP address) and the community RO string that they'll also provide you. You do not need to open any ports to the device which is useful if you are behind a firewall. You set this up in Configure->Alerts & Administration and it allows you to choose the SNMP version and set your community string. In this case you MUST open port UDP 161 directly to the device so you can poll it via SNMP but you have all the parameters of the standard SNMP MIB (check the table that appears in the above link). So the device IP that you enter is your Meraki IP address. In this case you set up the sensor as Custom SNMP and enter the MIB you wish to monitor directly. For example, to monitor WAN1 traffic I create a custom SNMP sensor, input MIB 1.3.6.1.2.1.31.1.1.1.6.1 (according the the table in the article above), set up as a Delta, set units to Mbits and divide by 120,000 in order to get Mbps. So, in my case I use both and set up two different devices for each customer. The dashboard MIB allows me to get the number of users connected in my customers network which is really useful and the standard device SNMP MIB allows me to monitor bandwidth on both WAN and LAN interfaces. I wish I could upload some screenshots to this thread because the graphs are soooooo cool. Hope this helps and I`m happy to help anybody out. Your best bet if you want to monitor Meraki devices with SNMP is to download IF-MIB, then use the MIB importer to import the MIB and save OID into your PRTG snmplibs folder. Then create your SNMP Library sensor using the IF-MIB. It's much faster than looking up the OIDs yourself. You can monitor pretty much any counters you want. In/out octets and in/out discards, plus any other counters you want and multiply/divide to your preference. x8 for bps, x.125 for kbps, etc. While PRTG doesn't offer built-in sensor for Meraki's devices our Custom Sensors can monitor most of the available information. The built-in SNMP Traffic Sensor should also work but doesn't as Meraki's SNMP agent implementation does not respond to uptime queries. From there you can also download the MERAKI-CLOUD-CONTROLLER-MIB which will be useful later. Download the MIB file and copy it into "C:\Program Files (x86)\PRTG Network Monitor\MIB\". Restart PRTG's Core Server afterwards. Once you've created a new device with the provided Address for SNMP Queries (e.g. : n7.meraki.com), configure it's SNMP Credentials (Version, Community and port) accordingly. Once the credentials are configured, add a new Sensor and search for the SNMP Custom Table Sensor. Press Continue, and PRTG will deploy a sensor for each available AP(Device), the primary channel (State) will tell you whenever the AP is connected or disconnected, when disconnected the sensor will go down. 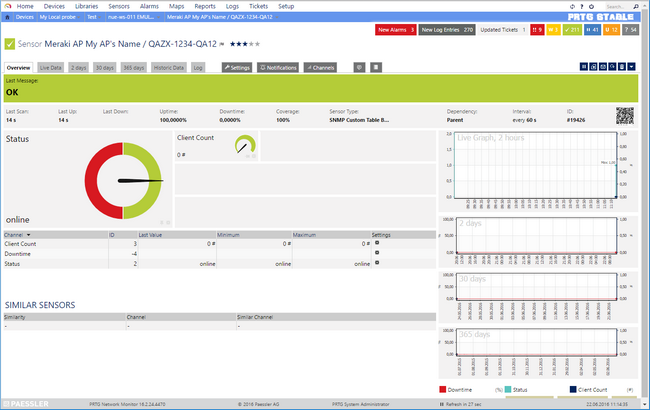 The secondary channel (Connected Clients) will display and graph the amount of clients connected to this Access Point. Within PRTG you'll need to make sure that you can reach each individual AP by It's IP Address, then create a new device for each AP you want to monitor directly, you'll also have to configure the SNMP Credentials accordingly. 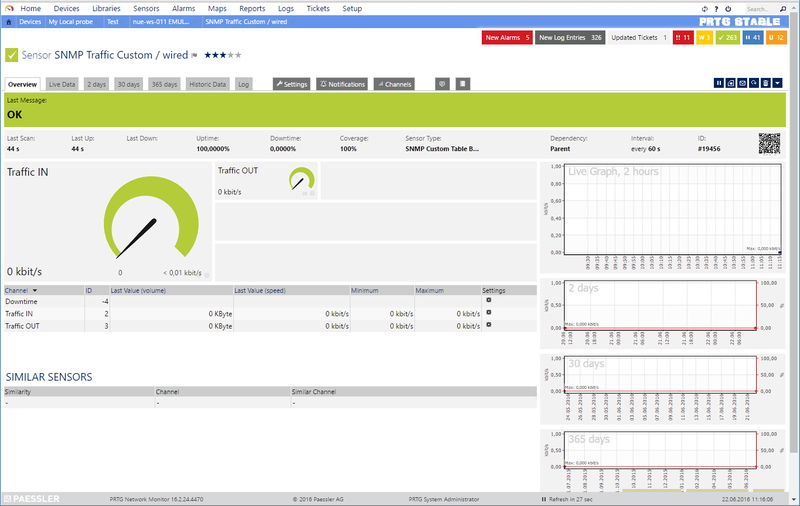 For each device that you've created within PRTG, add a new sensor, search for the SNMP Custom Table Sensor. During it's creation the Sensor will ask for the Table's OID, please enter 1.3.6.1.2.1.31.1.1. PRTG will then render a table and display the available information contained in the SNMP Interfaces Table of the polled device. The available interfaces will be wired0, wifi0 and wifi1. Press Continue, and PRTG will deploy a Traffic Sensor for each selected interface, please note that the sensor will not support the same features as the standard SNMP Traffic Sensor but it should work as a workaround. I attempted the above with poor results. First tried the mentioned OID 1.3.6.1.2.1.31.1.1. But this seems to only have values and report data sporadically. I also tried another OID table (ifTable), 1.3.6.1.2.1.2.2. With better but similar results. Paessler, can you please add full support for Meraki devices? This has been a frustrating exercise in MIB walking. Please note that our standard "SNMP Traffic" sensors use data from 1.3.6.1.2.1.31.1.1 and 1.3.6.1.2.1.2.2, if you experience issues with the Custom Table sensor with these tables the results with the built-in sensor would be exactly the same. The SNMP Counters needs to be reliable and constantly available for your monitoring to work properly. Please make sure to have configured/using at least SNMP V2c for best results. If counters are only delivering data "sporadically" kindly contact Meraki. PRTG is able to see all the my devices from the Meraki Dashboard fine and I've restarted PRTG Core Server and even the entire server but I can't see any of the lookup values from the custom device state definition file. I'm using the current version of PRTG if that helps. Please double check that the syntax of the prtg.customlookups.meraki.devstatus.ovl file is correct (XML) and that it was saved under C:\Program Files (x86)\PRTG Network Monitor\lookups\custom\. The files should be loaded by PRTG after a restart of the core server service(Or re-load lookups option from Setup > Administrative Tools), if not please check whenever PRTG created a new ticket "Error loading value lookup file" which it will do when PRTG is unable to load any of the present lookups. To workaround the issue, download and copy the meraki-cloud-controller-mib.MIB to C:\Program Files (x86)\PRTG Network Monitor\MIB on your core server and restart the Core Server before performing the auto-discovery. I love the work that has gone into finding a way to monitor Meraki devices. Thank you! I am attempting to monitor Meraki MX security appliances. I've found that using the template provided by Luciano does show up but upon running auto-discovery with the new template, results in auto-discovery completing very quickly without any sensors. I haven't been able to dig up much on this so far. Does anyone have any ideas how I can continue to troubleshoot this? PRTG checked for SNMP connectivity and it failed, it then halted the auto-discovery.
. Copy/paste the content of the code block below into a txt file and save it to your disk.
. On the PRTG Server, run the SNMP Tester again, but this time use the "Scan Script" test (instead of walk) and load the file that you've previously saved to disk. Please contact us via a support ticket and mention this KB-Post, we'll need the TXT log from the SNMP Tester to tell us more about what happened. You won't be able to add the attachment when opening the ticket, but as soon as you receive an confirmation e-mail regarding the ticket (with a case number PAEXXXXX), reply to that e-mail and forward us any attachments. Hello "Dunc the Punk", thank you for your input. I've uncovered an issue with the Check ID: snmp; routine, which caused it to fail quite often. I will be uploading a v.02 of the script very soon (I'll replace the contents of the download link above). The new version should address this. Since this will depend on a CDN update, please try downloading the device template/zip file again in the next 24 hours and try again. Please let me know the outcome. Please let me know the output from the discovery log then. Thanks for getting this setup. It would be nice if Meraki supported the RFC for SNMP correctly. I am having the same issue as Dunc, I can walk 1.3.6.1.2.1.31.1.1 but not 1.3.6.1.4.1.29671.1.1.4 (MX64 firewall). Testing on some wireless APs now. Actually I spoke too soon, even though I can't walk that second OID it still created the sensors for my MX64. Thanks again! I have this up an running against 3 MX65W's and have one question. The standard check interval is 30sec and in quite a few of the check we get zeros for the result - this happens on all 3 of the MX65's. Any ideas? There is no loss of service, no lag / latency on pings. Two of the units are remote via the Auto-VPN feature and the other is local to my LAN. It also isn't dependent on speed or volume of the links as this happens with very little load and huge data transfers. This is normal as the device most likely doesn't update its SNMP Counter that often. So when the device updates the counters only every 50 seconds, but you query them every 30 seconds, then you will receive 0-values as the counters were twice the same. Please increase the scanning interval to at least 60 seconds and it should work again. I am trying to do this for my MX84. I ran the autodiscovery with template and it found ping and http. But did not find the SNMP. I verified that snmp works with snmpwalk from command line on my computer. Not sure what I can do next to help troubleshoot the issue. Please check the "It's possible to troubleshoot the auto-discovery by inspecting the auto-discovery log, if you get entries like the one below ( NOT FOUND) it means that the required OID's aren't available." section of the guide, it provides instructions to check what happened during the auto-discovery. Also, please deploy an "SNMP Custom String" on the following OID in PRTG (on the MX84). What result do you get? Running PRTG 18.1.38.11934. Followed the directions here and still cannot get bandwidth monitoring set up on my MX64. The custom auto-discovery shows up in there, but never get any sensors set up. Has anyone successfully set up bandwidth monitoring on a Meraki MX64 with PRTG? Please help me troubleshoot why I can not successfully autodiscover by group. I can send you my full auto-discovery log if needed.